Our resorts have been a preferred destination for LUXURY DIRECT BEACHFRONT vacationing in the Space Coast area since 2009 – and this is our exquisite property GOLDEN SANDS® PEARL! GOLDEN SANDS® PEARL is top luxury and upscale, has 4 bedrooms (2 of them are north and south masters with ensuite bathrooms and direct ocean views), 4 ½ bathrooms, 2 king beds, 2 queen beds and 3 queen size sleeper sofas. The property has just been totally renovated top to bottom and inside out with newly built spectacular swimming pool and spa. The 180 degree ocean view from the upper floor bedrooms and a huge 12-ft. wide 75-ft. long upper deck is absolutely stunning! THIS IS UNSURPASSED AND UNMATCHED VACATION EXPERIENCE – STUNNING, MAGNIFICENT, LUXURIOUS AND EXQUISITE RESORT with 100 ft. of Atlantic Ocean frontage, pool & spa, 1 acre of prime PRIVATE beachfront in the heart of the Space Coast in proximity to all amenities and directly on Atlantic Ocean! The views are breathtaking from this RENOVATED TOP TO BOTTOM AND INSIDE OUT house with quality finishings in pure luxury and high end brand new quality furniture, modern bathrooms and a new pool & spa. The property has been fully registered with Florida state and Brevard county and licensed as a resort. Enjoy a stay WITH ATLANTIC OCEAN IN YOUR BACKYARD – no streets to cross, no crowded hotel elevators, this is YOUR OWN piece of paradise! The house has a total of 3900 sq. ft of living space, 4 bedrooms, 4 1/2 bathrooms and would sleep up to 14 people with 2 king, 2 queen beds and 3 queen size pull-out sofa beds (in the upper and lower floor living rooms). The house features a spectacular ground floor with a marble countertop kitchen, living and dining areas, a separate utility room with washer and dryer and a 2-piece bathroom. The second floor features beautifully decorated 4 bedrooms, 3 of them with DIRECT OCEAN VIEW EAST, 2 Master Suites (south and north sides of the floor) with king beds and master en-suite bathrooms. The panoramic 180 degree ocean view from the upper floor bedrooms and a huge 12-ft. wide 75-ft. long upper deck that spans the entire east side of the house (including the living room, 2 master bedrooms and third bedroom) is absolutely stunning! There are open high ceiling airy rooms, new flooring throughout, two new bathroom additions, outdoor shower, tropical professionally landscaped lot, large driveway with a 2-car garage.Telephones are with free unlimited calling to anywhere in the US and Canada. There is Wi-Fi with free unlimited Internet access within the property line. There are 6 TVs altogether – in each of the bedrooms and in each living room (ground and second floor) with Spectrum network channels and HDTV special pack, BlueRay DVD, PlayStation and supply of some movies and games. Full supply of kitchen crockery and cutlery has been provided, one set of linen and towels is provided for the duration of the stay. Initial supply of paper towels, paper tissues, toilet paper, shampoo, soap is provided. Beach chairs, umbrellas and boogie boards are located inside the deck boxes of the beach deck. Relax to the sound of the ocean waves, surf just in front of YOUR HOUSE, watch dolphins from the huge upper deck, cook out, observe rocket launches from YOUR beach deck, look at the stars during the night or walk down the steps to the white, sandy beach any time you desire. This is YOUR OWN PRIVATE BEACH. GOLDEN SANDS® PEARL is located in Indialantic between Melbourne Causeway and Eau Gallie Causeway in the heart of the Space Coast, a 72 mile stretch along Florida’s Atlantic (East) Coast between Cape Canaveral and Sebastian inlet. The area beaches are closest to Orlando with some of the best surfing in the country and spectacular array of wildlife, unspoiled natural habitats, sanctuaries and preserves. At the same time you will be within an easy reach to everything – surrounded by nice restaurants, just an hour’s drive from Orlando and all of its attractions, less than half an hour away from Cape Canaveral and Kennedy Space Center and just two and a half hours away from South Beach in Miami. Fishing, boating, sunbathing, hiking, walking, golfing, water ski, jet ski, treasure hunt, you can have it all! This is truly Florida beach experience for your whole party while staying in the Space Coast area! Please note that the tennis court on the aerial pictures of the PEARL belongs to our other property GOLDEN SANDS® EMERALD - you must be a guest staying at the EMERALD to use the tennis court. - GOLDEN SANDS® EMERALD - in Indialantic (HomeAway 3728294) - UNSURPASSED vacation experience no one else offers - professional full size TENNIS COURT, POOL and SPA with 200 ft. of Atlantic Ocean frontage on 2 acres of prime beachfront. 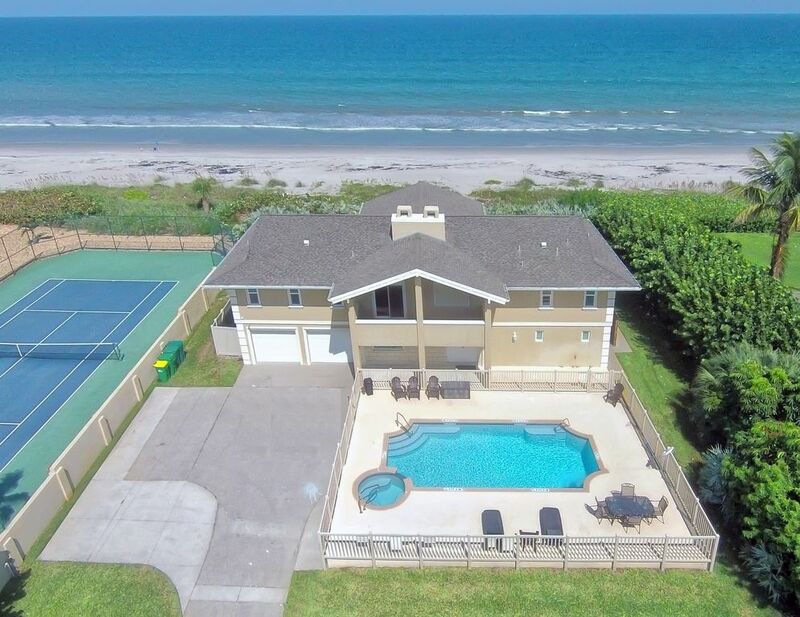 - GOLDEN SANDS® RUBY - in Melbourne Beach (HomeAway #288314) - LUXURY direct beachfront house with 6 bedrooms, 5 bathrooms, sleeps 16 and 80 ft. of Atlantic Ocean frontage. In 2009 I became a property owner in Melbourne Beach. This is one of the most beautiful and relaxing places I have ever seen (even as compared to other places in such countries as Australia and Brazil!) Since then our resorts have become a preferred destination for LUXURY PRIVATE BEACHFRONT vacationing in the Space Coast area – and THIS IS OUR 3RD – AND NEWEST - RESORT IN THE AREA - GOLDEN SANDS® PEARL. Every time I come to the area, I look forward to relaxing to the spectacular view of the ocean, sound of the waves, watching dolphins (and sometimes whales) from the deck, or walking down the steps to the white, sandy beach any time I desire on a PRIVATE BEACH. Watching rockets launch at the Kennedy Space center from the backyard of the house is absolutely remarkable, and having so much privacy while being in the middle of so many amenities is truly incredible. There are so many things that make time spent at the house truly enjoyable! Right on the Ocean - can't be closer! Private resort - registered as a resort with Florida State and Brevard County. Free WiFi (through wireless Brighthouse router) - browse the Internet while on the beach! Huge 12-ft wide and 75 ft long upper level deck facing Atlantic Ocean (east) leading to the beach deck and the beach. 2nd floor patio facing front of the house (west). (2) Two huge 12-ft wide and 75 ft long decks facing Atlantic Ocean (east) - one for each level leading to the beach deck and the beach. 2nd floor patio facing front of the house (west). Relax to the sound of the ocean waves, surf just in front of YOUR HOUSE, watch dolphins from the huge upper deck, cook out, observe rocket launches from YOUR beach deck, look at the stars during the night or walk down the steps to the white, sandy beach any time you desire. This is as close as you can get to YOUR OWN PRIVATE BEACH. Beautiful property loved our stay! This each house was awesome. The views of the ocean and beach were wonderful. The property was comfortable and had most everything we needed. The views of the ocean were incredible! My entire family enjoyed our stay. A couple of things that would add to the comfort of this rental would be an umbrella for the poolside table which would offer shade to sun-sensitive people and an ottoman for the living room and the family room. It was one of the best family and friend vacations ever! We split our days between the beach and the pool! Lots of fun and great memories were made by all! Even better than we had hoped for. Starting with the excellent communication with Daniel (throughout the booking process), to dealing with the property manager Zach (throughout our stay), there was absolutely nothing to complain about. It was the cleanest rental we have EVER stayed in. It was spacious and comfortable. We were able to cook large family meals in the well stocked kitchen, but also had restaurant options when desired. Bedrooms were big and comfortable. Beach is clean and and not crowded. To sum it up, if it fits into your budget, you will not be disappointed. Ps, the adjoining property is equally beautiful! this was a perfect place for the family to get together and enjoy the beach. very comfortable. I would highly recommend this property and management group to anyone who wants a relaxing pleasant vacation. thanks for an enjoyable vacation. Once again, we had a wonderful time in this beautiful home. Everything is clean and functional. It is evident that this home is cared for and very accommodating. Our family had a very enjoyable relaxing week. While on an evening walk on the beach, we got to see a turtle nesting. Will be back! Our resorts have been a preferred destination for LUXURY DIRECT BEACHFRONT vacationing in the Space Coast area since 2009 – and THIS IS OUR 3RD – AND NEWEST - RESORT IN THE AREA - GOLDEN SANDS® PEARL! THIS IS UNSURPASSED AND UNMATCHED VACATION EXPERIENCE – STUNNING, MAGNIFICENT, LUXURIOUS AND EXQUISITE RESORT with 100 ft. of Atlantic Ocean frontage, 1 acre of prime beachfront in the heart of the Space Coast in proximity to all amenities and directly on Atlantic Ocean! The resort is located in Indialantic between Melbourne Causeway and Eau Galle Causeway in the heart of the Space Coast, a 72 mile stretch along Florida’s Atlantic (East) Coast between Cape Canaveral and Sebastian inlet. The area beaches are closest to Orlando with some of the best surfing in the country and spectacular array of wildlife, unspoiled natural habitats, sanctuaries and preserves. At the same time you will be within an easy reach to everything – surrounded by nice restaurants, just an hour’s drive from Orlando and all of its attractions, less than half an hour away from Cape Canaveral and Kennedy Space Center and just two and a half hours away from South Beach in Miami.